Offering a variety of different lodging options. You can choose from the main lodge or one of our three rustic, trailside cabins. 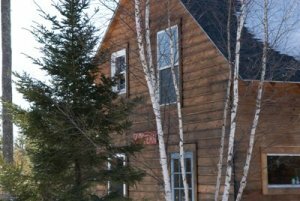 Willow Brook Lodge offers direct access to XC ski, snowshoeing, and walking trails, in addition to private launch site to the Big Androscoggin River for fishing, kayaking, and canoeing. The Main lodge, while in the winter it houses our ski and rental shop, sufficiently accommodates families and friends looking for a relaxing, homey place to rest after all kinds of seasonal activities, such as local downhill skiing, snow tubing, x-c skiing (directly out the front door), hiking, biking, and kayaking. The main lodge offers 3 bedrooms (sleeps up to 8), 4 baths, kitchen and dining room, as well as sitting room with fireplace. Camp Fern is one of our rustic cabins, located on Farwell Mountain. This cabin offers amazing vistas of the Carter Moriahs, Mount Washington, and the Presidentials, as well as Sunday River. This cabin is located directly on our trail system, offering many opportunities to ski in the winter and walk or hike and berry pick in the summer. Private access to the river is included, too. This cabin sleeps up to 8. Farwell Mountain cabin, also on Farwell Mountain, is a cozy, hunting camp settled in a unique forest with some mountain vistas. Farwell Mtn. cabin is also located right on our trails system and offers many kinds of walking and hiking adventures.